You can bring the Alps to your front room with this magical Narnia style Kerbl Cat House Lodge! Your cat will feel like they have just finished from a day of tobogganing down the famous yellow runs and can now spend the evening relaxing in-front of a log fire, drinking brandy, and wearing silly hats. Should you want to put this magnificent piece of architecture outside, then don’t worry! The Kerbl Cat House Lodge is weather proofed and can hold it’s own against the famously un-predictable British weather. 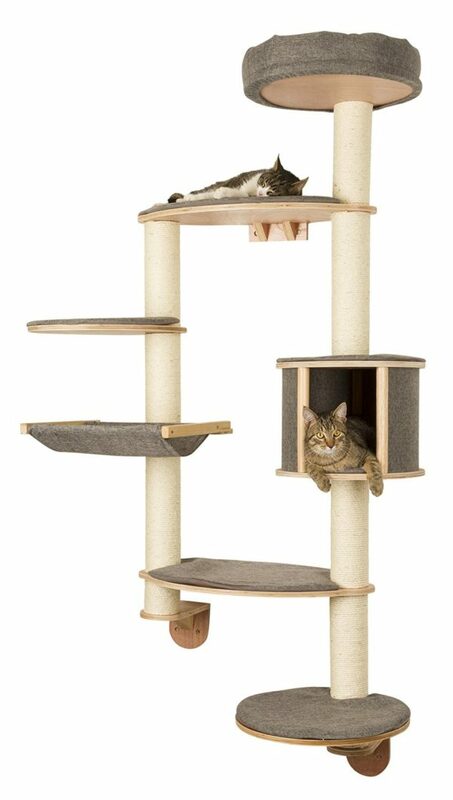 Your cats will be protected against the elements in the downstairs section as the designers have included a swing door with a transparent flap to keep them nice and cosy. The finish on the Kerbl Cat House Lodge is glazed with protective wood paint and is delivered in pieces for self assembly. I know what your thinking, “My husband Jim, blew a sizeable hole in my wall when he tried to assemble my IKEA TV unit?” Please do not panic! The Kerbl Cat House Lodge comes with very simple and easy to follow instructions that even Jim can manage! We have literally just had our patio installed so this cat house was perfect to give out cats a safe little space to relax when they need. Too be honest, I was expecting something that would last a new months and then need replacing, but actually this is really well made and all of the edges are nicely smoothed. It did take about 10 minutes to get up and running but our cats love it! Highly recommend.